Origami is the ancient Japanese art of turning a flat piece of paper into a three-dimensional shape. 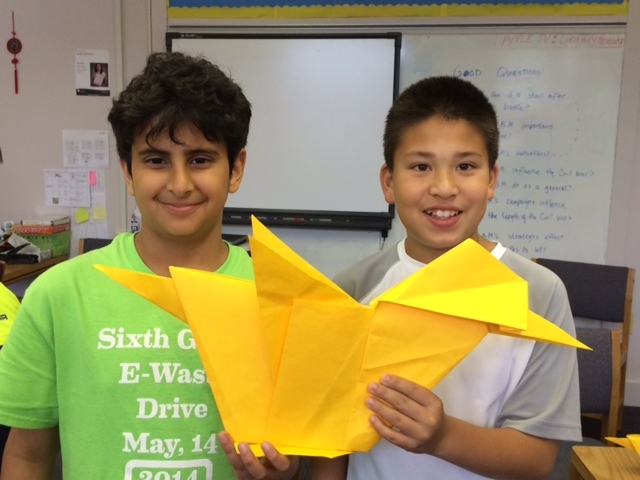 When you think of origami, you probably imagine colorful birds or flowers made out of paper. But did you know this creative pursuit is also the perfect educational tool to prepare the minds of tomorrow? When folding origami, the whole brain is engaged, helping with concentration, sequencing, spatial reasoning, fine motor skills, and creativity. It also develops memory and fosters confidence. Personally, I find origami both a calming and an exhilarating experience. It stimulates my creativity, but also helps me channel my energy. It gives me focus and peace. It teaches me spatial reasoning as well as patience. Even though it is challenging, it is relaxing at the same time. Origami is an art, a science, and a therapy. As the teacher of Langley’s weekly origami elective class for Middle Schoolers, I am able to see many of the skills that students need develop right before my eyes. As they attempt to fold a challenging new piece of origami, I see them work through their frustrations; solve problems independently and together; learn the importance of discipline and precision; and delay gratification. I also witness their intense satisfaction and feelings of empowerment when they finish their model. Who knew a little piece of paper could have such a big effect on the development of young minds? Want to learn some origami tips and tricks? This entry was posted in by Caroline Bosc, Creativity, Origamy and tagged Langley, Left Brain and Right Brain, Middle Schoolers, Origami, solve problems independently, spatial reasoning, the ancient Japanese art, The Langley School by langleyleopards. Bookmark the permalink.